Easy Steps to increasing the value of your business BEFORE you sell it. For the past several years I’ve had a hypothesis that companies are leaving a lot of valuation on the table as they look for their exit. The last couple of months I put this hypothesis to the test by meeting with people who are actually helping companies through this process. Most of the CPA’s and lawyers I’ve talked to seem to agree that when it comes time for a company to sell, they often take their foot off of the accelerator. The most likely cause is that leadership is half way out the door and has already starting looking toward their next chapter, be it retirement or a new career opportunity. It could also be happening because the company is running out of funds and they simply are trying to conserve resources to make the bottom line as good as it can for the impending financial audits. Increasing the valuation is a major challenge for small businesses and entrepreneurs. Most of them are already doing less with more. They are often wearing multiple hats and trying to get the most out of every dollar — that’s their normal state. Throw the stress of maximize the value of the business they’ve put so much effort and time into building and it’s enough to break most small businesses. 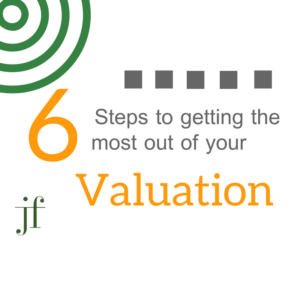 Here are a few easy ways to keep the valuation high and the stress low(er). Hire an experienced outside advisor who can help you. Preparing your business for sale needs to include having an expert valuation conducted. Selling your business is one of the most important moments in your life as an entrepreneur. Professional advice will help ensure you get it right. Don’t expect high offers if you’re only breaking even. This can be a great time to do an audit of your processes and cut the excess. This has to be done carefully because the last thing you want to create is an air of panic within your walls or in the minds of your potential buyers. But nearly every business can find a way to operate more efficiently. Keep as much momentum as you can. As mentioned above of the biggest mistakes business owners make is to take their foot off the accelerator before they cross the finish line. The moment you stop investing in your people, new equipment, maintenance and process improvements is the moment you start reducing the value of your company. Clearly document your vision – independent of the sale. Even if a sale is your only viable option, you should create a formal marketing and business plan. These documents help investors see the potential in your business. And presenting measurable goals and milestones for the coming years will give your business credibility as a growing concern with long-term potential. Your people are still you best asset. I’ve lead a lot of teams through mergers and acquisitions, and no matter the environment training and empowering people never fails to pay off. Pay particular attention to the management team and keep turnover low. Retention bonuses can work well here. When your buyers walk the halls, they will notice the vibe of your employees and it’s your responsibility to foster a positive environment. Don’t underestimate the value of your marketing dollars. In many ways, selling your company is a time to ramp up your marketing. The adage “fake it till you make it” is widely underrated. Marketing can help you look successful even if you’re struggling and that’s half the battle. Just like selling a house — a little curb appeal goes a very long way when your buyers are doing their “drive by” assessments. Your social media should be current. Your advertising should be active and your plan should be operating at full speed. You can even add some flare by asking for testimonials explaining what keeps them coming back to your company vs. shopping their business elsewhere. If you think having a strategic mindset applies only to businesses considerably larger than yours, I can help you see why that’s not the case. Small business owners actually face a much better return on their investment by working to increase your values drivers.